It is a strange new world I find myself in, very strange and very new, but the world is my playground and I’m in the mood to play! I guess my new “owner” introduced me already. 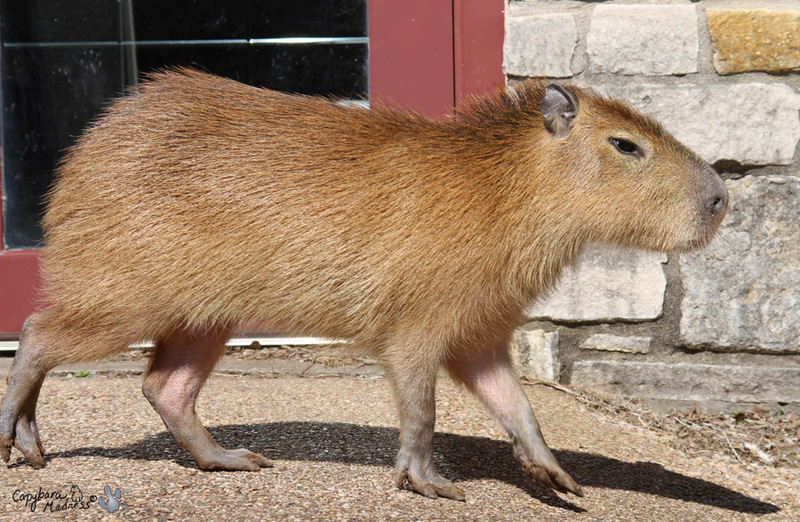 She gave me this fancy name, Garibaldi Rous, that is more of a name for a diplomat than for a roguish young capybara such as myself. Call me Gari, that name fits me way better. As for her, I’m not into the owner thing. I am going to call her Melly because it rhymes with smelly, you can interpret that any way you want. Speaking of smells, this new home has a million of them. 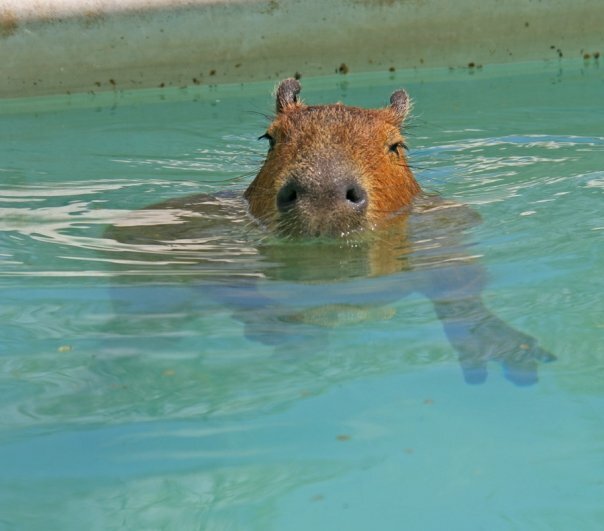 A lot are of another capybara, Caplin Rous, but they are old smells and I’m getting used to them. At first they made me very nervous. 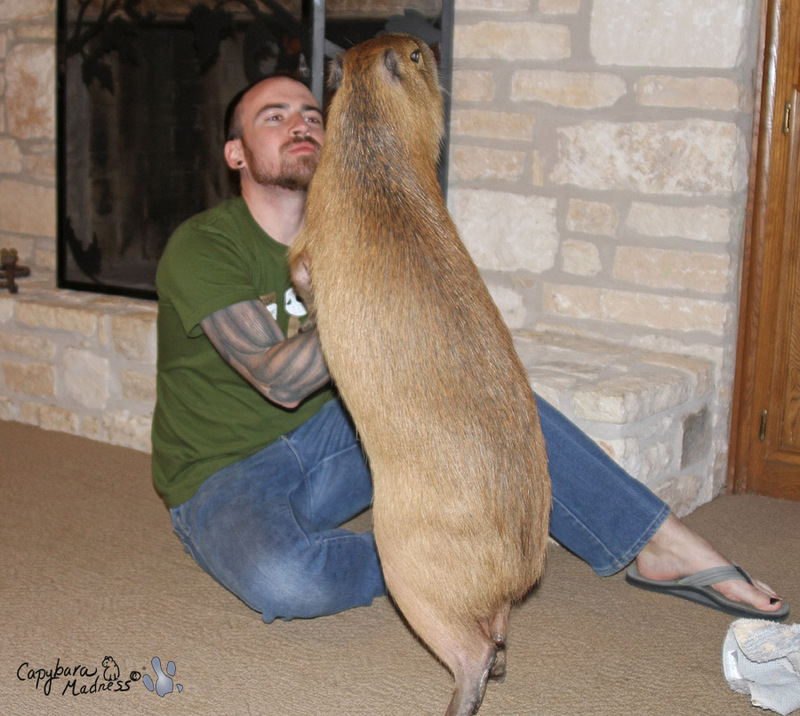 I expected Caplin to jump out from behind every corner, grab me in his enormous teeth and rip me into little shreds of capybara meat. I had to mark the hole house with my own scent, which I still refresh every day just in case. The great thing about my new home is all the space. It is enormous. And there’s a big yard outside too! And rabbits for me to chase through the whole place. A really crazy thing is all the water. 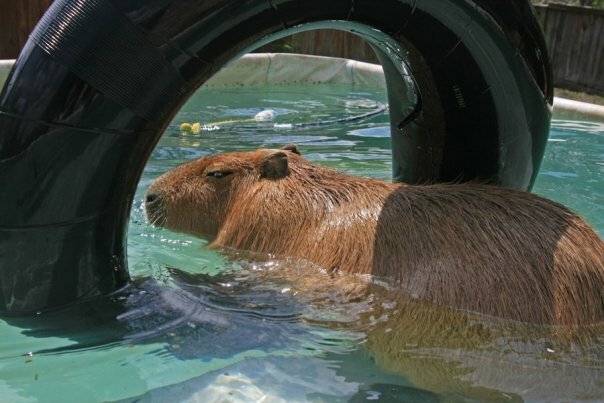 Like all capybaras, I love water. I didn’t have much to play with at my old home but there is water everywhere here! I even have TWO poop bowls in the bathroom. I guess that video is pretty revealing. 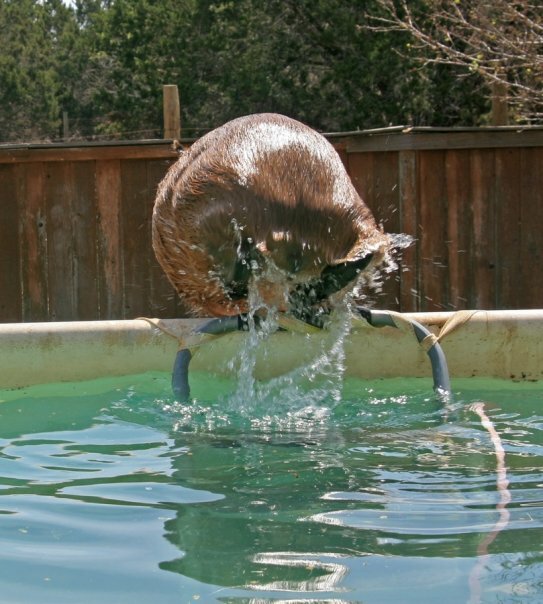 It shows how much I love the water, how cute I am, how energetic I am and how sharp my teeth are all in one short little clip. One thing I don’t like about this new home is the harness issue. 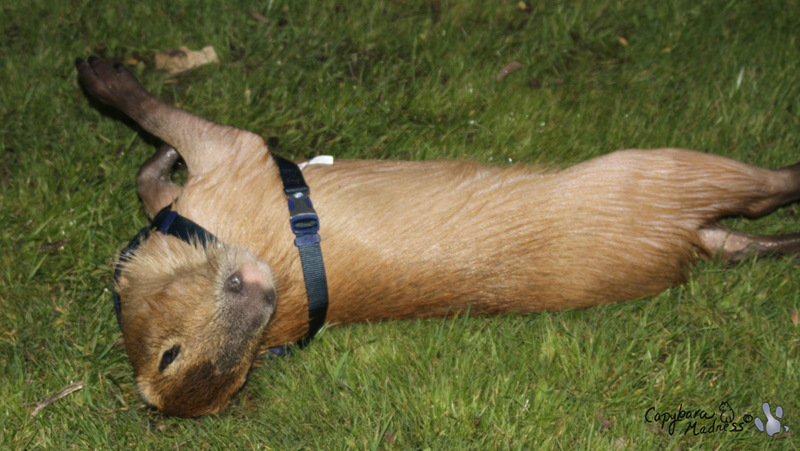 Smelly–I mean Melly–has this thing about me wearing a harness and it just is not working for me. I think I am going to win the harness battle because I have a lot more energy than she does. Okay, I do admit that I look dashing in it but I still prefer the wild look. Rolling on land can work too. 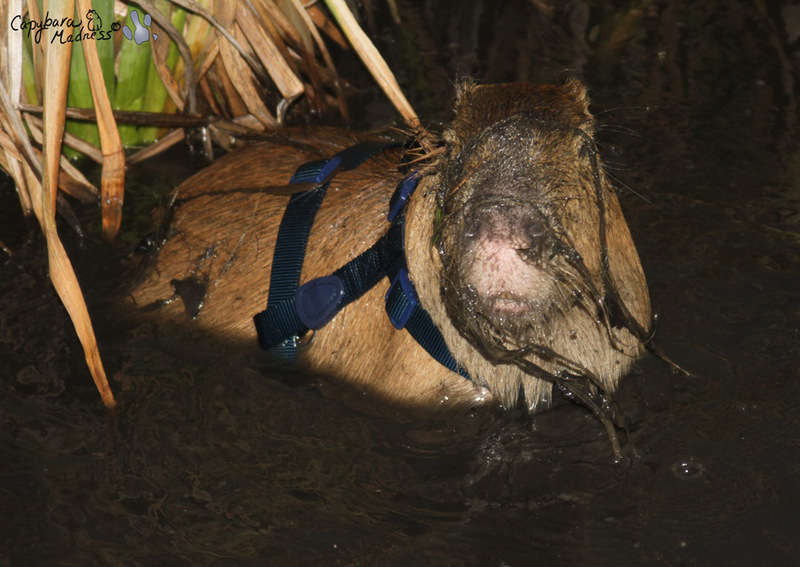 If I could get that harness off in the pond, I’m pretty sure that would be the end of it. I could bury it in the muck where no one would ever find it. Aside from the water, there are some other perks here. I have met some nice people. There’s Rick and Melly of course. They are okay. Sheldon comes over sometimes but I’m reserving judgement on him for the time being. But Coral and Carl get two pig paws up. They are my kind of people. Well, that’s it for my first blog post, I’ve got some rabbits to chase. 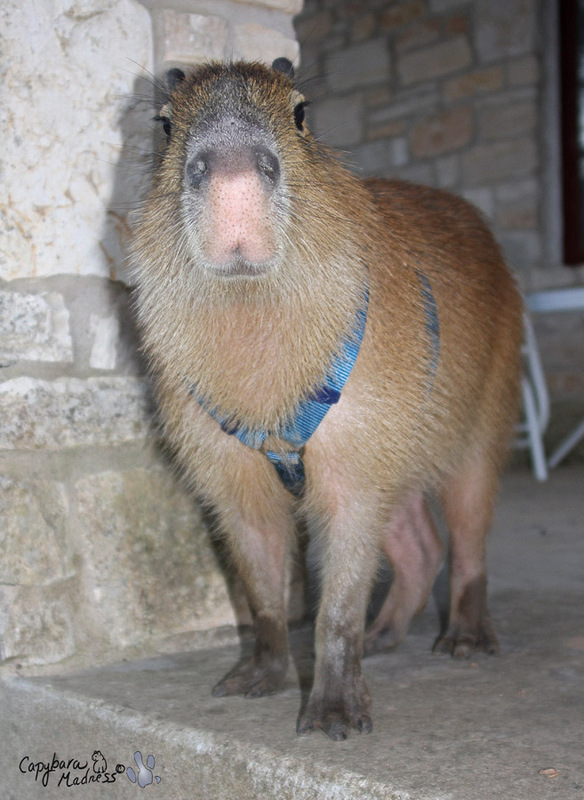 Yes, Gari, you ARE quite dashing…and the new teal harness only adds to your allure! Great to finally hear from you!! Looks like little(?) Gari’s gaining weight! YAY! Geri, you will get used to the harness in time and the smells of Caplin will get less. Melly is a great owner–I know this from what Caplin said–You’ll like her in time, too. Gari, it’s so wonderful to hear your voice. You’ve got lots of fans already and we love you and are ready to hear more about your adventures. Write on little one! Great introduction to Gari. Look forward to reading more from him! Awesome job, Melanie. Love Gari he is a cutie with an attitude. So happy for you ( and him) that he came along when he did. Welcome…It is nice to hear about you, from you. I am so glad to read your posts! You are a lucky little boy! Gari, I’m happy you found your blogging voice. Enjoy your new home! Gari, you have you own style! 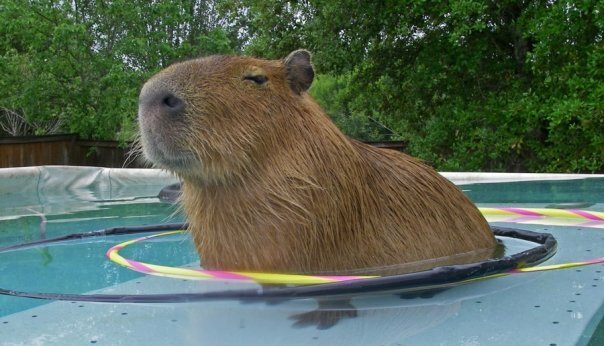 And, like one graet writer said, “Style is a man” – or capybara, in this case. And, Caplin would not hurt you. He would greet you. Gari has a distinctive voice already, as he splashes through the pool, tries to expel his harness and explore his new surroundings. 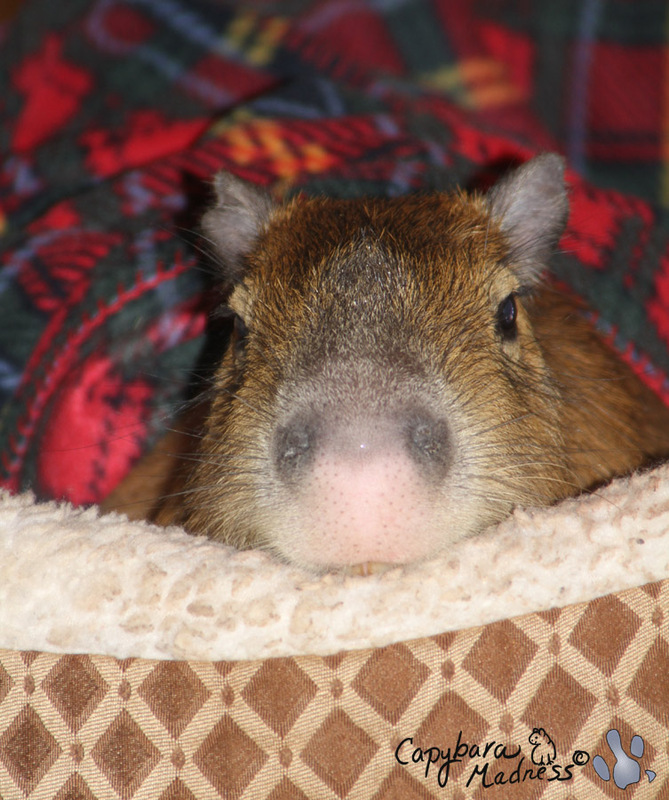 Welcome Gari, you charming capy, you!! 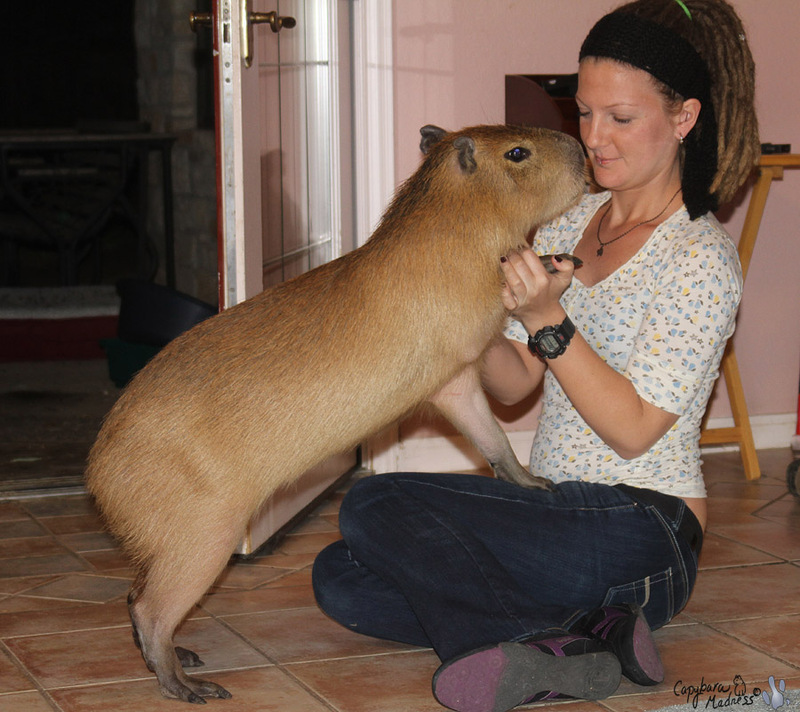 Big kisses Gari – do you like kisses, I hope so because I bet you are going to get loads. It is still early days Melanie but things are looking good, I bet Caplin is looking down on you and laughing. Gari, you are pretty handsome! Melly is the best owner you could possibly dream of! Try to be sweet! Welcome to the best new life ever Gari! i know you will love it there! Dear Gari, So good to hear your voice! You will, in time, see how wonderful life with Melly will be! You just can’t imagine how lucky you are to have such a wonderful mom. I am so glad that you are adjusting. Don’t be afraid of Caplin’s smells, he was one in a million and he would of taught you to be the second in million! Hello Gari! You sure look very cute in your bed. Feel free to put your scent all over your new home. just isn’t your thing. 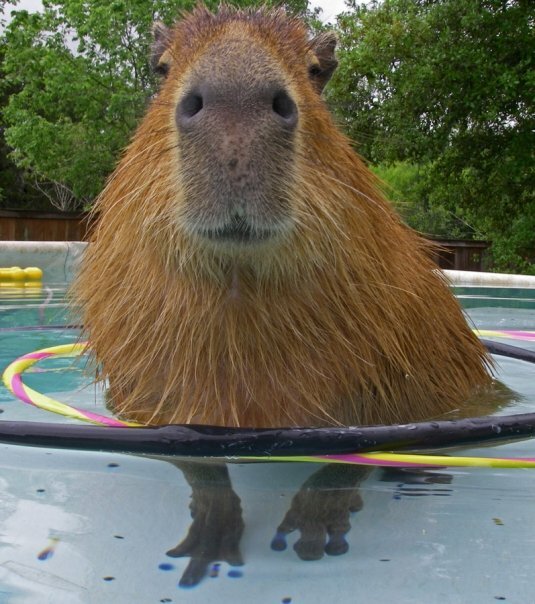 You sure make that pool look very tasty. 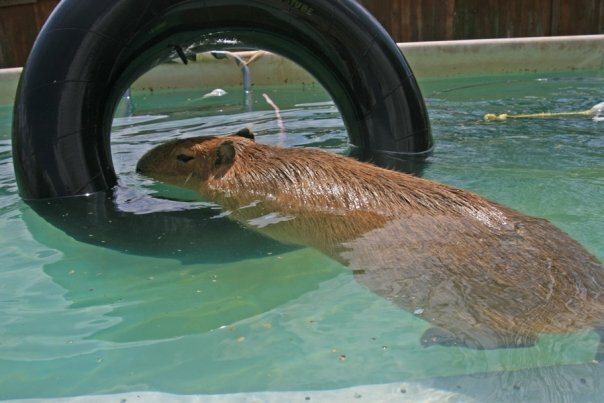 Don’t eat the whole thing because you need a place to swim. Sounds like you are making friends slowly. Please give Melanie a chance. Yes, she smells but Melanie can make you a big celebrity! Who knows maybe you can have your own reality show — I hate reality shows but I’d watch you. Gari looks so cute in the photos. And I can infer that Gari has a revenge on harnesses. Gari sure is SPUNKY! 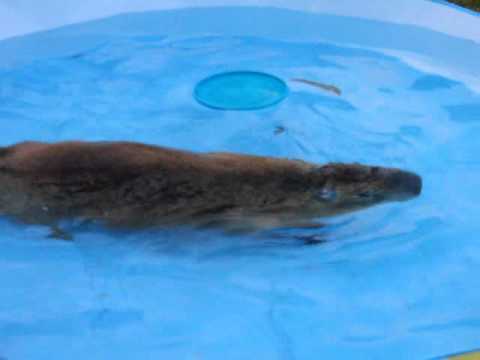 It was crazy how he lept from the pool and ran around – that was as close to a “bunny binky” (the dance of joy that rabbits do) as I’ve ever seen! Maybe he’s spending so much time with Maple and Oakley that he thinks he IS a bunny. I vote for some bunny ears for Spring (though I’m sure he’d like them just as much as he enjoys his harness)…. I’m glad to see you are settling in! 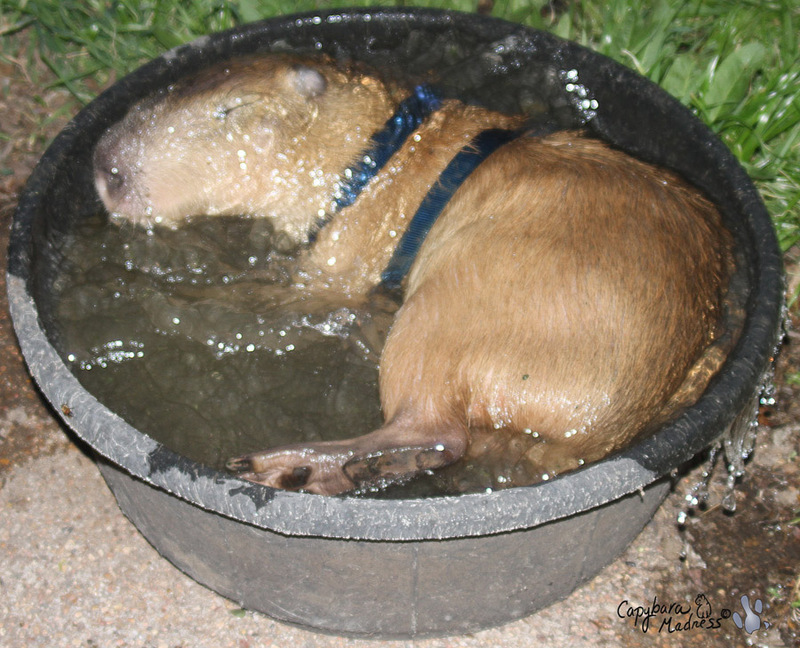 Go easy on old Smelly, she is the best owner a capy could have, or so Caplin told me. Did they tell you about Lent yet? How wonderful to hear you posting, Gari!! I know you’ll have much to share!! 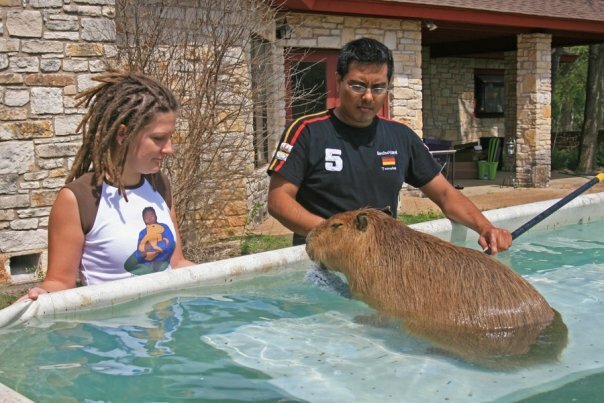 Don’t be mean to Melanie, she knows how to treat a capybara! I know you may not think so right now, but harnesses are good things. Harnesses let you go out there and explore even more of your new world. Just think of all the things you can scent mark then! My guinea pigs run around and “popcorn” like that when they are very happy (usually at veggie time, go figure). Hi Gari sweetie. It’s so good to read your blog. You sound like a smart kid. 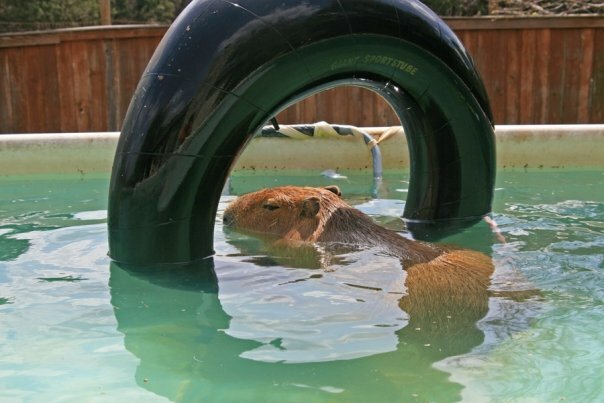 Be happy, and take a roll in the muck for me! Welcome, welcome, welcome Gari…I am so happy for you and Melly…Caplin will always remain in my heart also.